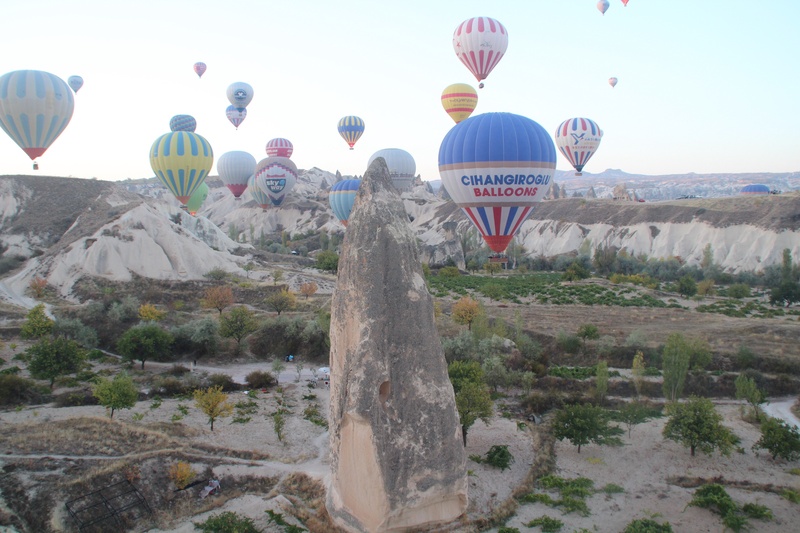 A touch of acrophobia was not going to deter me from the aerial spectacle of Cappadocia in Turkey’s Central Anatolia. It’s 4am in the morning and the sparrows aren’t even awake, let alone up and about. My minibus bumps along a road filled with craters, but I can’t see a thing for two reasons. Firstly the sun is still a long way from rising, and secondly the windows are covered in condensation, because it’s so cold the temperature outside is changing the air vapour inside to dew. When packing for a middle eastern vacation it is generally long, flowing maxi skirts and thin, long-sleeved blouses to shield you from the blaring sun and the censorious eyes of the menfolk. But even the singlet, polo and shirt teamed with leggings and jeans, woollen bed socks, topped with puffa jacket and tightly wrapped scarf do not stop my teeth from chattering. Least of all, I am not going to be topping a best-dressed list any time soon. As the minibus lurches along in the dark, I spot distant lights on the horizon. We pull up to a building that would fit perfectly into the swamplands of the Mississippi Delta. Walking into the dimly lit entry I almost expect to see fires smouldering in 44-gallon drums, surrounded by hairy men in flannelette. Instead there are tables set up with urns and warm rolls. Never has a polystyrene cup of tea tasted so good or provided such warmth for my hands. I hover around the urn and cast envious glances at the loved-up couples wrapped in each other’s arms. That is, until the balloons begin to inflate. Everyone rushes to jockey for a position. Not only is there the spectacle of yards of multi-coloured silk billowing and rippling as they inflate, the balloons also send out a delicious warm blast. Once they are inflated and standing tall like silent sentinels in the darkness of the, as yet, invisible terrain, it becomes quite a panic to clamber into the baskets. I am separated from my companions and am jostled into the care of my Polish pilot, Borys. As the balloon begins to ascend, Borys is all business as he hurriedly explains the emergency instructions should anything go awry. My face must give away my trepidation as he is quick to reassure me that things most certainly will not. 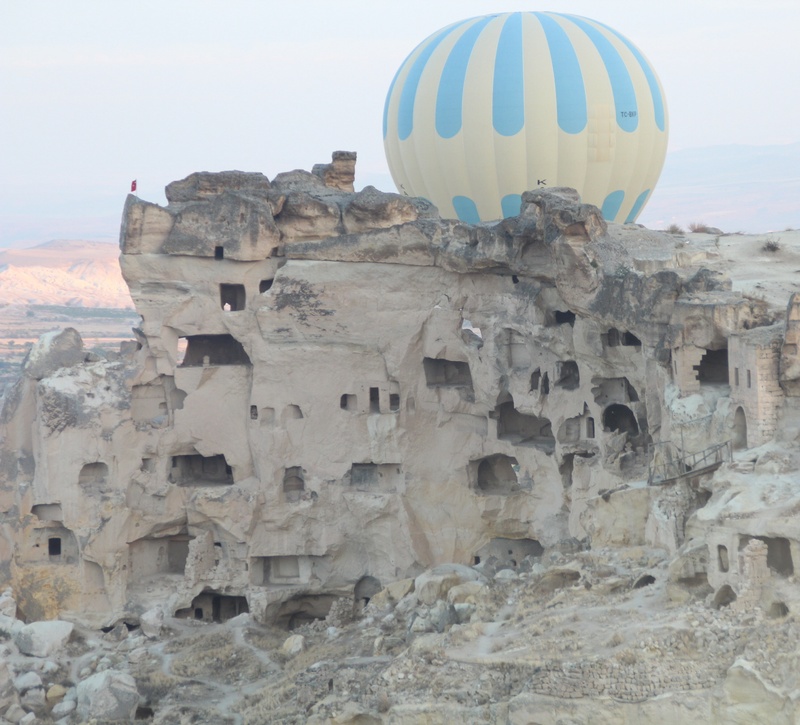 As the sky gently lightens, the balloon floats silently over Cappadocia with its eerie luna-like formations. The quiet of the morning is occasionally cut by the roar of the flame as the balloon glides upwards over a rocky rise. Another balloon rises up, filling the skyline – and my vision – like a monolith sun emerging over the horizon. Looking back there are dozens more balloons dotted like daubs of paint across the sky. At times the balloon appears to be barely skimming above the ground. I feel I could step out of the basket and go exploring the abandoned cave houses and fairy chimneys. But then, as the balloon jostles its way upwards again, my heart leaps into my throat as we bump into another balloon and are so close I could shake hands with the occupants in the next basket. We are drifting so high, the cars I can see driving along below on ribbons of road look like matchbox cars. All too soon it’s time to land. I assume position in anticipation of a rough landing, only to be returned to earth feeling a jolt little more than a bump against a piece of furniture. “See little lady, I promised I would keep you safe” says Borys as he lifts me out of the basket. I am so relieved I want to kiss the ground, but settle for kissing his cheek instead.